Woke up to another day in Japan! On the second day, we left home at 10.15am. It was supposed to be 10am but we Malaysians mah! Ok lah, actually we spent quite some time in the kitchen preparing lunch - nasi lemak with Khadijah's instant sambal tumis instant Khadijah's. Berbaloi gak aku beli - memang sedap! 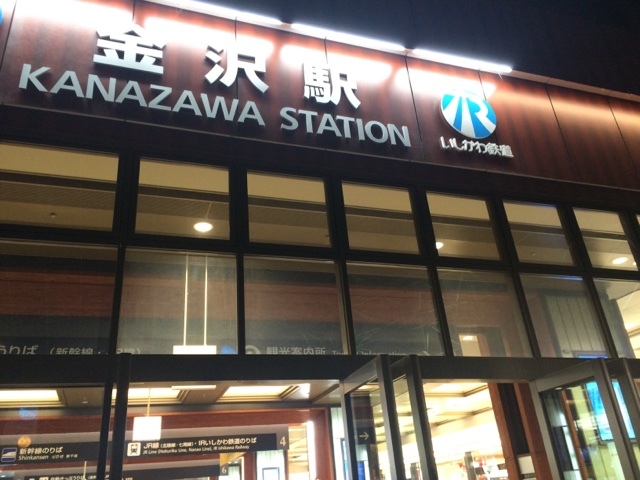 From Fukui, we drove about 1 hour to Kanazawa. 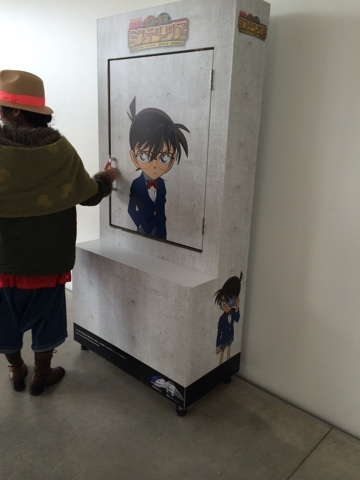 This museum is all about contemporary arts in this century (we are still in 21st century, right?) All types of arts can be found here - comic characters, paintings, art installations and many more. 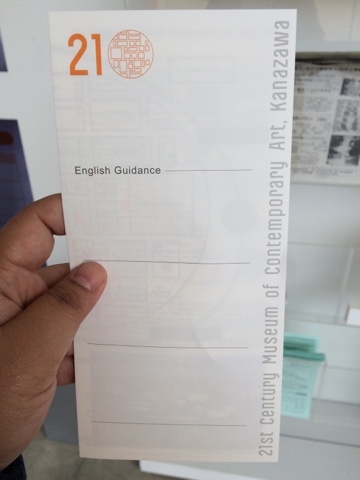 Too bad I am really buta huruf about art, so I couldn't really appreciate the museum that much. Colour activity house - something about filter arts. Anak2 aku appreciate la lari keluar masuk tempat ni..
Less than hour later, we decided to go and have lunch in the car. Nak piknik kat padang kat atas, sejuk pulak. Brrr! Glad to have brought home-cooked lunch sebab bila sejuk, rasa lapar pulak sampai Suami Terchenta tambah 2-3 kali! 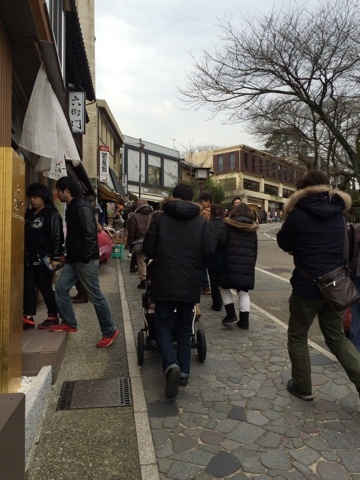 Since Kanazawa is a tourist attraction spot, this place was crowded with local and foreign tourists including us. Seriously, Kanazawa is a really beautiful town I wanna stay here and eat gold ice-cream every day! Yup, you read me right! 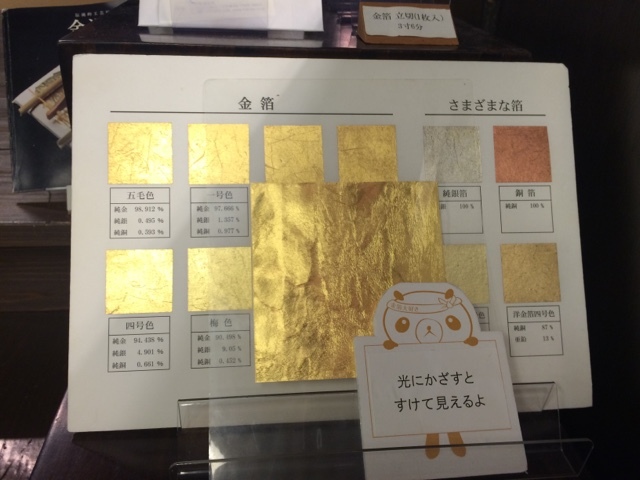 Kanazawa is famous for producing gold leaf, made by beating gold leaf to extremely flimsy sheet. They use the gold leaf on almost everything from decorating temples, religious artefacts, handicrafts to even food! All along the way, we passed countless of souvenir shops selling handicrafts as well as ice-cream and snack shops selling exotic flavour ice-cream including gold ice cream. Belum sampai ke Castle, kiteorg dah berhenti menyinggah beli aiskrim. Can't imagine eating ice-cream in the cold weather, no? But that's what people in Japan like to do! This is one food you oughta try (¥780 @ RM27 kalau tak silap). Baru betul2 kaya! After walking for about 15 minutes (including a few stops at the shops to admire the myriads of souvenirs), we finally reached Kanazawa Castle. Tall, white gates concealed even taller, white castle building within. 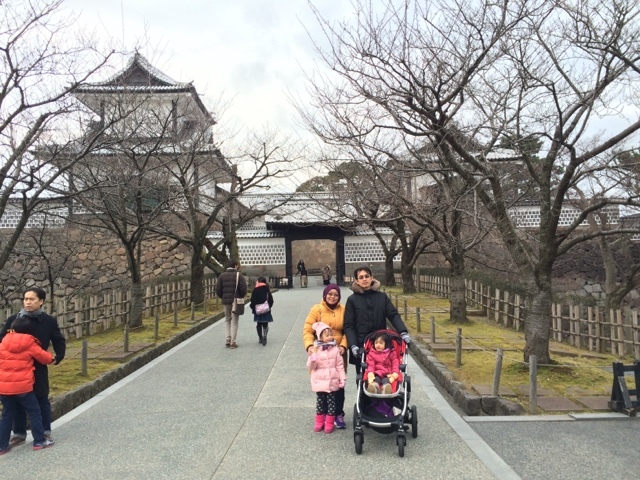 We learned that the castle was built in the 16th century by Lord Maeda Toshiee who ruled over Taga clan for more than 280 years. It has been repaired on several occasions to preserve the cultural architecture and has been used as military base as well as university campus before. 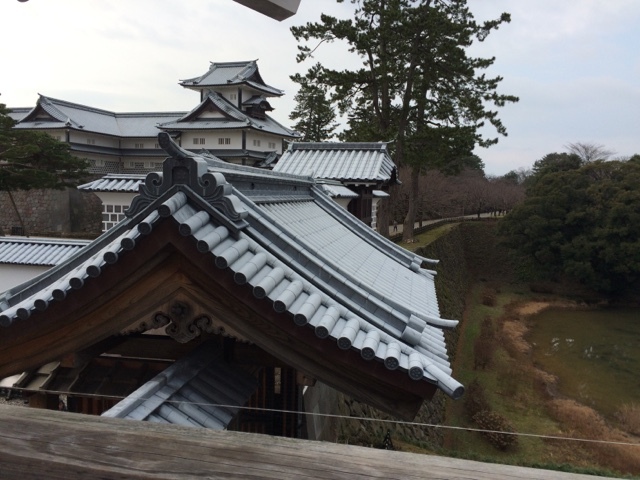 Actually there's not much activities going on except touring around the castle ground and admiring the Japanese architecture. 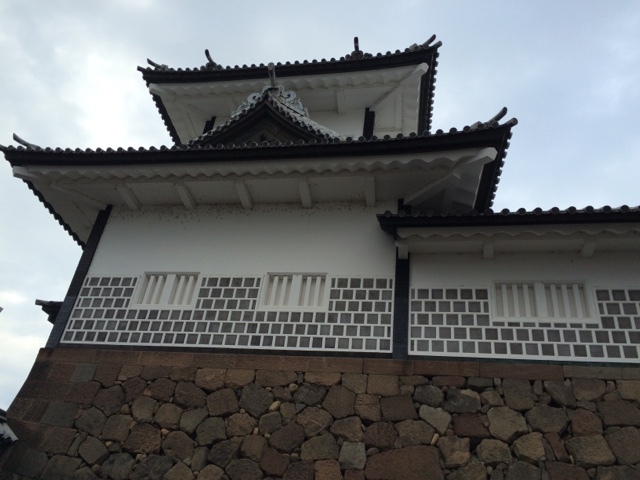 One has to pay admission fee of ¥310 to enter the diamond-shaped turret or the warehouse, otherwise admission to the castle compound and the Kahokumon-gate is free. 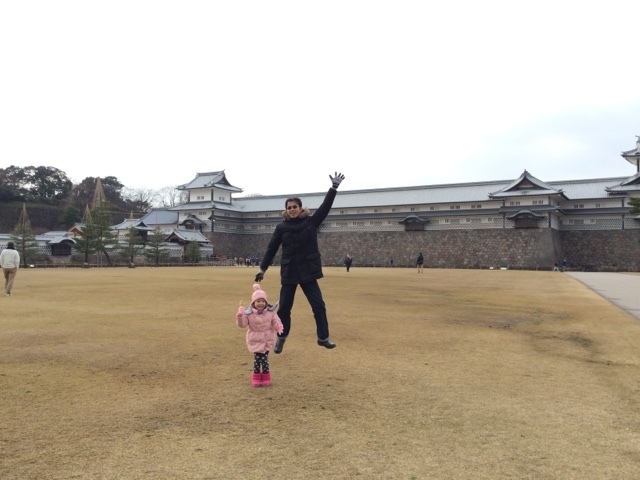 Kanazawa Castle behind us. Felt like we were transported to 16th century in Japan! 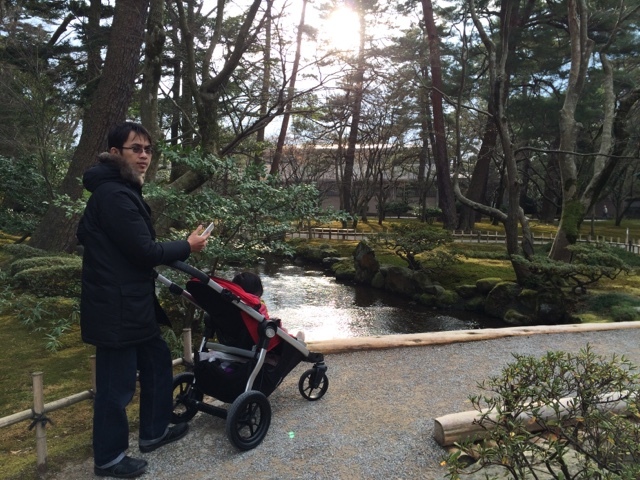 After touring the Kanazawa Castle, we moved on to Kenrokuen Garden which was just across the road from the castle. Dubbed one of the most beautiful gardens built by feudal lords, Kenrokuen, which means "having six factors", was given the name because of the six attributes that bring out the perfect landscape of the garden: spaciousness, tranquility, artifice, antiquity, water courses, and magnificent view from the garden. 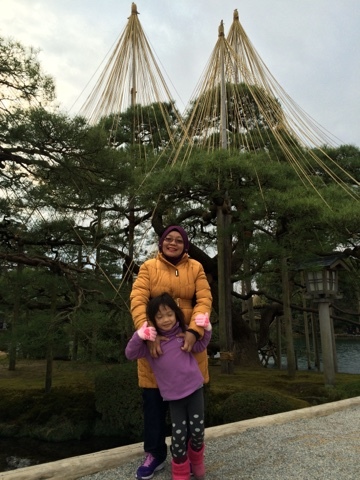 If you are wondering why there is a cone-shaped ropes attached to the tree branches, it is called yukitsuri (literally snow hanging), meant to protect the branches from breaking from the weight of snow. Guess there's no need for that since it is not snowing this year, huh? So serene... Felt like I just wandered into a magical forest! Man-made pond and stream, maintained by the Lord Maeda's family for centuries. 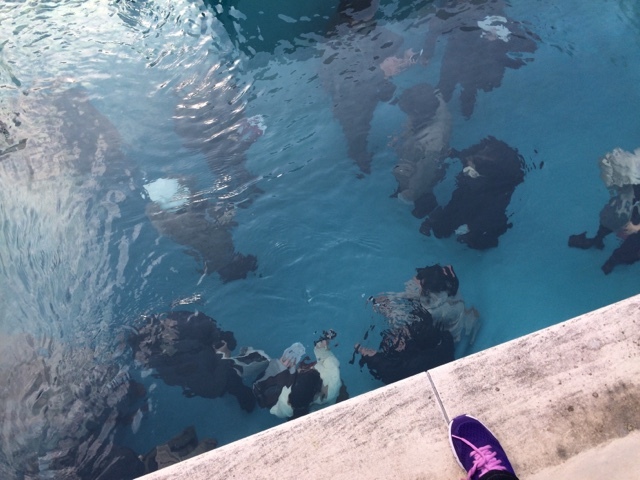 The water is crystal clear! Khayla was really enjoying herself in the garden because she can run around and dragged her feet in the small pebbles that littered the pathways. 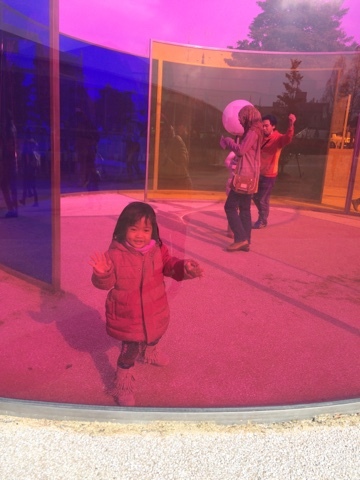 Kid seemed to have so much energy even though she hardly ate anything! Perhaps it was due to the cold weather? 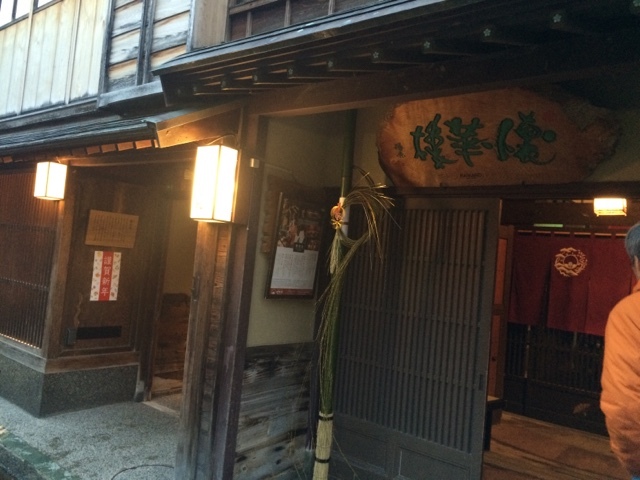 Next, we made a short stop at the famous Higashi Chaya. Why is it famous, you ask? 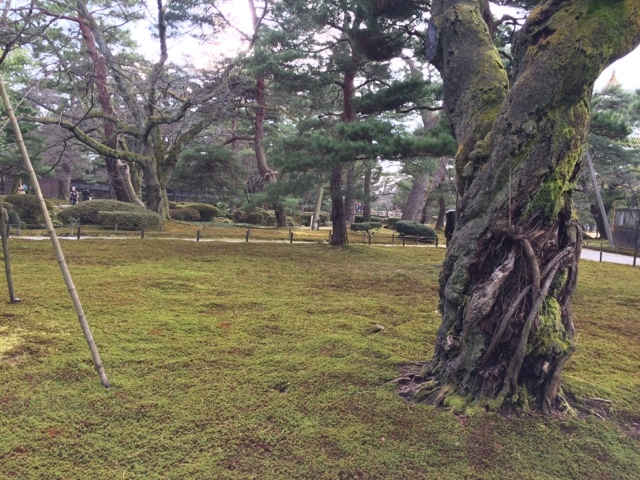 This is the place where tourists can view historical rows of teahouses reminiscent of the Edo period. Geishas used to strut along the row of houses and entertained guests in the teahouses. 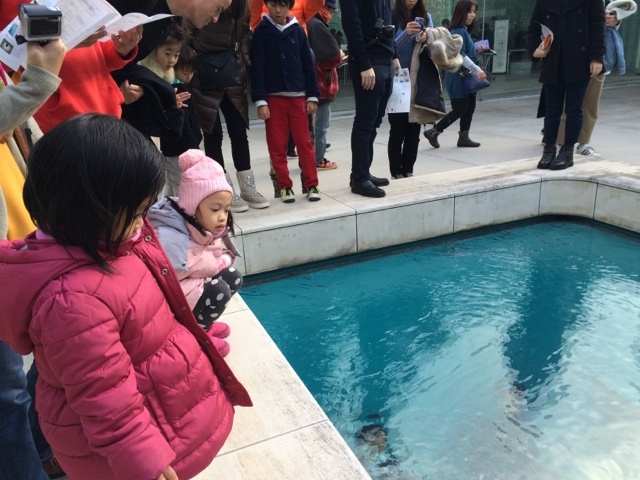 This area is steeped in Japanese traditional culture, which makes a rich experience for first-time tourists like us. 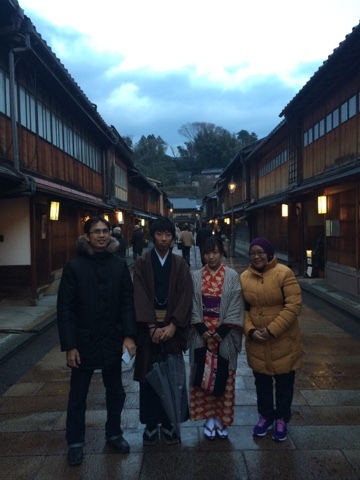 With a couple dressed in traditional kimono attire. Orang Jepun selalunya pakai kimono masa Tahun Baru dan perayaan tertentu. 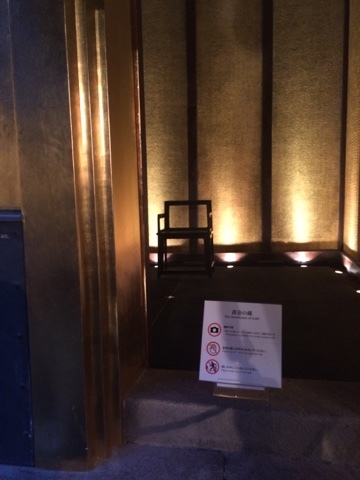 Teahouse covered completely in 24K gold. Kau hader?? Gold seemed to be the biggest industry here, and everything from cakes, tea and ice cream to facial tissue and face masque are mixed with gold! 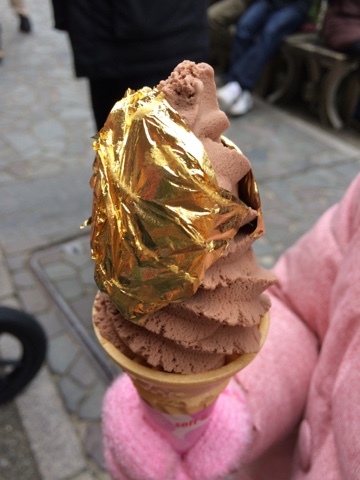 The only thing we could afford is gold ice cream LOL! 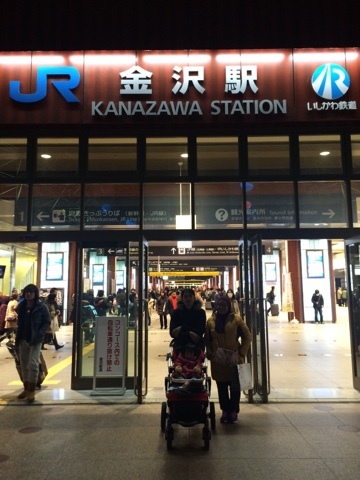 Last but not least, we made a stop at Kanazawa Station. Besides being a transportation hub for the district, there's also a really big souvenir shop in the station where we wanted to get souvenirs. 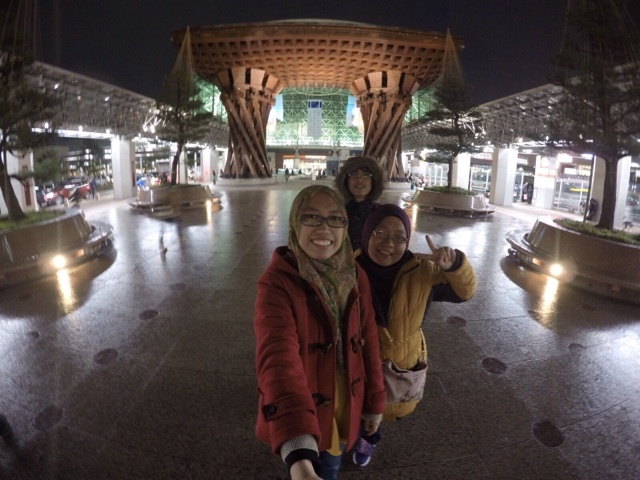 Just outside of Kanazawa Station, there is a really huge red-colored landmark known as Tsuzumi Gate. 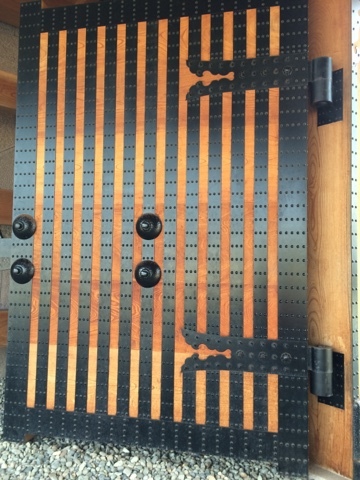 The design is based on Japanese traditional hand drums (tsuzumi). 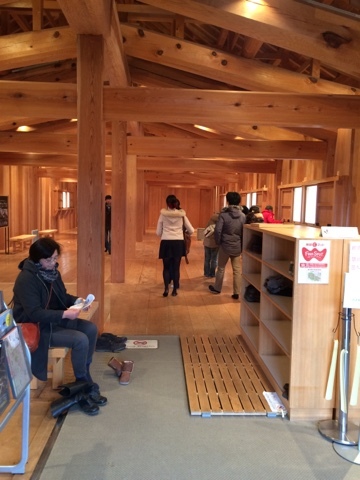 After snapping photos, we headed to the souvenir shops where various Kanazawa's souvenirs are on sale. 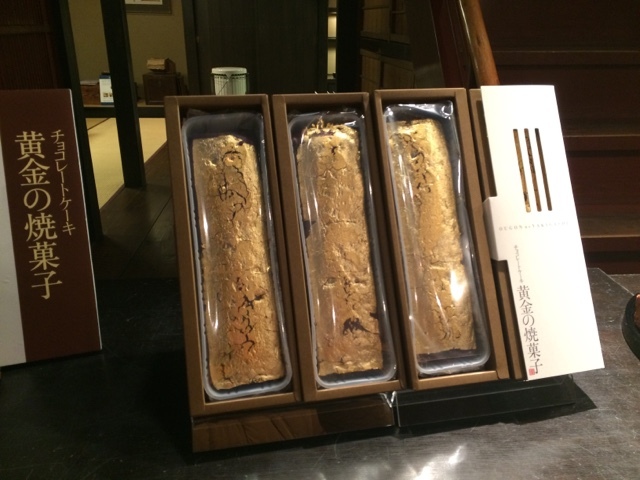 Most of the souvenirs are Kanazawa pastries since Kanazawa is famed for their sweet treats! I felt like I wanted to stay here and savour all the pastries in the shop! They looked so yummy with various candy colors and sweet fillings! 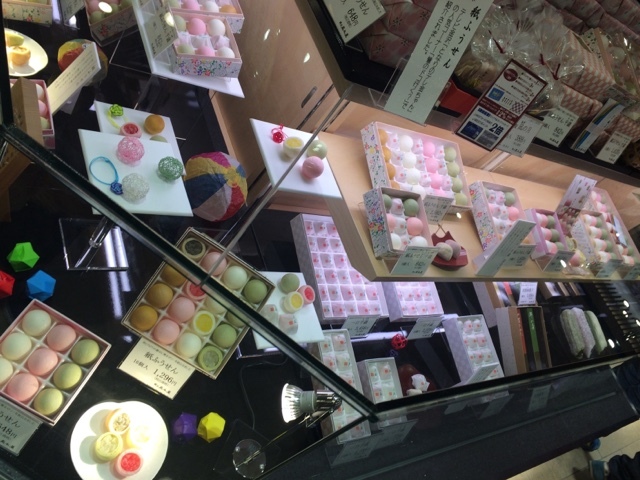 My favourite snack / pastry in Japan - mochis! This photo made me drool! 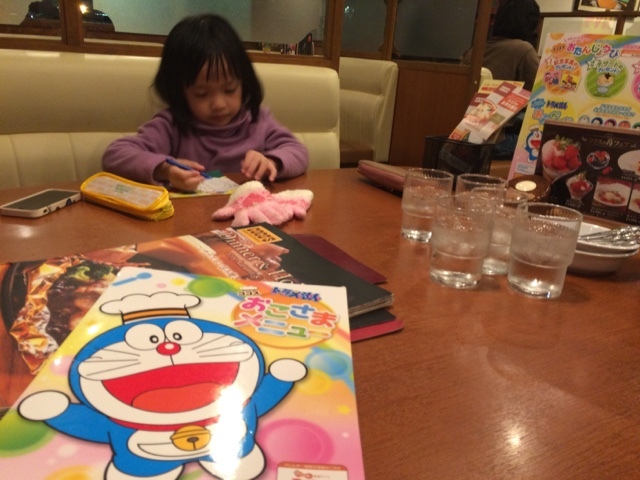 Before we headed home, we had our dinner back in Fukui. I loved this restaurant because it is kids-friendly. While waiting for our food, they doled out coloring pencils and coloring paper so Khayla & Khadeeja are kept occupied with their activity. 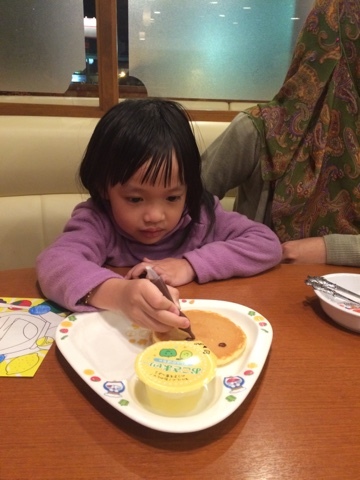 We ordered pancakes for Khayla and they gave a chocolate pen so she could decorate her own pancake. Isn't that a wonderful idea? 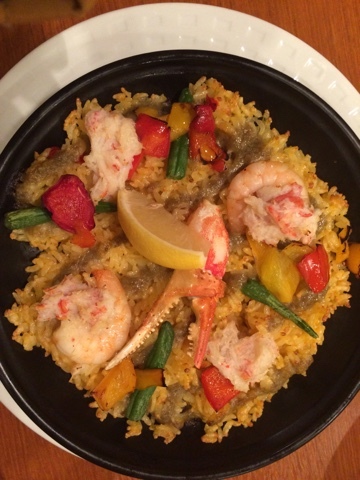 As for me, the cold weather made me crave for hot and spicy food - so I ordered seafood paella with hot sauce. With food being out of the way, it was time to head back home and rest for another journey the next day - to Nagoya. Wanna ask its convenient to drive at Osaka? 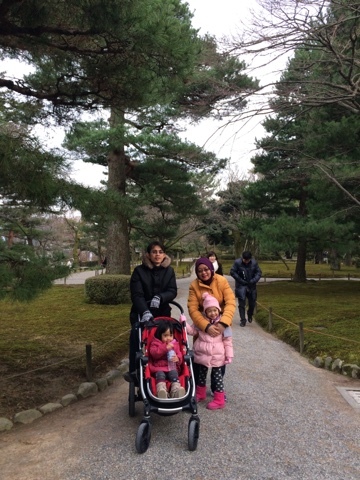 me and my family will travelling to Osaka soon with 2 kids. Thinking to drive or using public transport to Osaka,Kyoto and Takayama. any suggestion or recommendation itinerary. Hi Pityee! Thanks for dropping by. Takayama is quite further up from Osaka, almost 4 hours journey by car/bus. 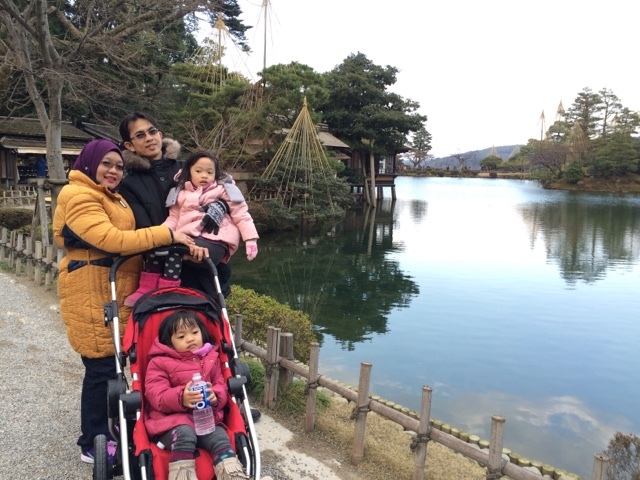 It's probably convenient to rent a car to go to Takayama rather than taking public transport especially if your kids are still young. But if you are sightseeing within Osaka city, taking public transport is more convenient. As for Kyoto, I think it's probably better to drive if you wish to cover more areas (if you only have one day to do your sightseeing around Kyoto). 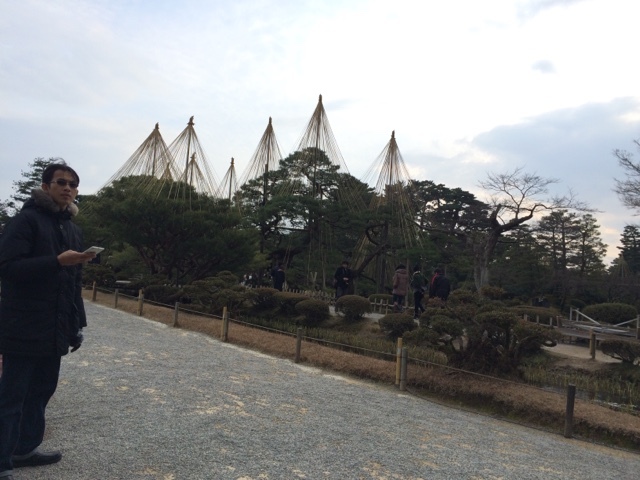 We only managed to cover Kinkakuji and the Bamboo Grove (Arashimaya) in one day since we had to cover the areas on foot. Otherwise, public transport is not too bad too.